In the event of a discrepancy between the online version of the HSAS Constitution & Bylaws and the original signed hard copy, the original signed hard copy content will supersede the online content of the document. Please report any discrepancies found in the online version of the HSAS Constitution & Bylaws to communicate@hsas.ca. The name of the Association shall be Health Sciences Association of Saskatchewan. The head office of the Association shall be designated from time to time by a resolution of the Executive Council. (a) To seek certification as the certified bargaining agent of all Members of the Association employed in the health sciences and on behalf of such Members to regulate relations between Members of the Association and their Employers, or organizations of Employers. (b) To organize groups engaged in health science professions or occupations in the provision of health care in the Province of Saskatchewan into Bargaining Units of the Association. (c) To bargain collectively on behalf of its Members with Employers and further, to apply to the Labour Relations Board for certification as the bargaining agent on behalf of Members or a group of Members, pursuant to the provisions of The Saskatchewan Employment Act, as amended or replaced, from time to time. (d) To participate in or assist Bargaining Units of the Association in the resolution of disputes arising with Employers or organizations of Employers. (e) To promote the social and economic well-being and interests of individuals employed in the health science professions or occupations in Saskatchewan and to establish and maintain the best possible standards of remuneration and working conditions consistent with the continuation of high standards of patient/client care. (f) To support the improvement of services provided by the health sciences professions and occupations and to advance the scientific, educational, professional and economic welfare of all Members of the health sciences professions and occupations. (g) To create a job action committee when the Executive Council deems it appropriate to do so. (af) “Vice-President” means the individual elected to that position in accordance with section 7.03. (a) The division of the Constitution and Bylaws into articles, sections, subsections, paragraphs, subparagraphs and clauses and the insertion of headings are for convenience of reference only and are not to be considered in construing the terms and provisions of the Bylaws or the Constitution and are not to be deemed to clarify, modify or explain the effect of those terms or provisions. (iii) words that mean individuals will include bodies corporate, partnerships, syndicates, trusts and any number of persons. (c) The invalidity or unenforceability of any provision of the Bylaws shall not affect the validity or enforceability of the remaining provisions of the Bylaws. (i) Where the time for doing an act falls on a day that is not a business day at the Association’s head office, the time is extended to the next day that is a business day at the Association’s head office. (ii) Where the time for doing an act in the Association’s business office falls on a day on which the Association’s head office is not open during its regular business hours, the time is extended to include the next day on which the Association’s head office is open. (B) the last day shall be included. (iv) In calculating time expressed as a number of clear days, weeks, months, or years, or as “at least” or “not less than” a number of days, weeks, months, or years, the first and last days shall be excluded. (v) A period of time expressed to begin or end at, on, or with a specified day includes that day. (vi) A period of time expressed to continue to or until a specified day includes that day. (vii) A period of time expressed to be after, from, or before a specified day does not include that day. (e) In these Bylaws, the phrase “from time to time” means on one or more occasions. (a) A group of individuals may apply, in writing, to the Executive Council for membership in the Association. (b) The Executive Council, in its discretion, may grant or refuse membership or terminate the membership of a Member as it deems appropriate in the circumstances, subject to the provisions of the Bylaws. (i) An individual who is permanently employed in an out-of-scope capacity with an Employer is not eligible to be a Member. (ii) A Member employed in a temporary out-of-scope capacity with an Employer shall cease to be a Member on the 366th day after commencing employment in that temporary out-of-scope capacity unless the Association and the Employer mutually agree otherwise. (iii) If an individual to whom the provisions of paragraph 2.01(c)(ii) apply ceases to be employed by an Employer in an out-of-scope capacity and returns to employment with an Employer in an in-scope capacity, the Executive Council is entitled to re-instate that individual as a Member. (v) previously met the criteria described in paragraph 2.02(a)(i) but the leave requirements to fulfill her term of office in an elected position in the Association and the application of the provisions of a Collective Agreement have led to the termination of her employment. (vi) attend any Association Meeting and do so at her own expense unless her expenses are reimbursable under the approved expense guidelines referred to in section 16.08. (ii) becomes temporarily employed in an out-of-scope capacity with an Employer and remains so employed for up to and including three hundred and sixty-five (365) days. (b) If a Member whom the Executive Council has already re-classified as an Inactive Member, pursuant to paragraph 2.03(a)(ii), ceases to be employed with an Employer in an out-of-scope capacity and returns to work with an Employer in an in-scope capacity, the Executive Council is entitled to re-classify that Member as an Active Member. (c) An Inactive Member is entitled to attend any Association Meeting at her own expense. (a) The Executive Council, in its discretion, is entitled to confer the designation of Honourary Member on an individual who is not a Member when that individual has rendered outstanding service to the Association. (b) An Honourary Member is entitled to attend any Association Meeting at her own expense. (vi) share in the distribution of the remaining property on the liquidation and dissolution of the Association. (c) accept the disciplinary decisions and any resulting penalties that the Association administers in accordance with article 13. The Executive Council shall determine from time to time the policy relating to initiation fees for admittance of Members, membership dues, and any assessments. The Annual Meeting shall be held within seventy (70) days after the end of each Fiscal Year of the Association. (b) shall call a Special Meeting upon the written request of at least ten percent (10%) of the Active Members. (a) The President shall give Members notice of the time and place of an Association Meeting at least fifteen (15) days before the proposed Association Meeting. (iii) include the full wording of resolutions to be considered at the Association Meeting. (c) The fact that a Member does not receive notice of an Association Meeting shall not invalidate the proceedings or the business transacted at that Association Meeting. (a) Only Delegates, or in their absence, alternate Delegates, selected in the manner described in this section 3.04, are entitled to vote at Association Meetings. (b) Each Union Region with up to and including one hundred (100) Active Members is entitled to elect one (1) Delegate to attend each Association Meeting. (c) Each Union Region with more than one hundred (100) Active Members is entitled to elect one (1) additional Delegate for each additional one hundred (100) Active Members or portion of one hundred (100) Active Members to attend each Association Meeting. (d) In addition to the Delegates elected in accordance with subsections 3.04(b) and 3.04(c), each member of the Executive Council is automatically a Delegate to each Association Meeting. (e) Only an Active Member employed within a Union Region is eligible to be elected as a Delegate in the Union Region in which she is employed. (f) An Active Member who is employed in more than one Union Region is eligible to be nominated and elected in only one Union Region. (g) Only an Active Member employed within a Union Region is entitled to nominate an individual to the position of Delegate for that Union Region. (h) Where a ballot is required to elect one or more Delegates, Active Members shall vote for Delegates by mail-in ballot, handled in the manner described in article 4. (i) A nominee not elected as a Delegate for a Union Region shall be deemed to be an alternate Delegate for that Union Region, and, where there is more than one, they shall be ranked in order of the number of votes received. (j) Except as set out in the Bylaws, the procedures for electing Delegates and alternate Delegates shall be as established by the Executive Council, and the Executive Council shall notify all Members of those procedures annually before the Annual Meeting. (k) An alternate Delegate, when attending and voting in place of the Delegate she is replacing, is deemed to be the Delegate. (ii) act in the best interests of the Association. (m) A Delegate holds office as a Delegate for the Association Meeting for which she was elected a Delegate. (a) A quorum for an Association Meeting is a Simple Majority of the Delegates who have registered before the call to order on the first day of the Association Meeting. (b) Except as provided in subsection 3.05(c), if a quorum is not present in the meeting room at the time and place fixed for the Association Meeting as stated in the notice of the Association Meeting, or at any time during the Association Meeting, the Association Meeting shall stand adjourned and no other business may be transacted. (iii) take measures to obtain a quorum and, after a quorum has been re-established, carry on with the Association Meeting. (a) The President, or in her absence, the Vice-President, or, in the absence of both the President and the Vice-President, the President’s designate, shall preside as Chair at every Association Meeting. (b) If there is no Chair for an Association Meeting, or if a Chair is not present within thirty (30) minutes after the time appointed for holding the Association Meeting, or if the individual described in subsection 3.06(a) is unwilling to act as Chair, the members of the Executive Committee who are present at the Association Meeting shall appoint one of their number to be Chair of the Association Meeting. (a) The rules relating to resolutions to be considered at an Association Meeting are set out in this section 3.07.
has given written notice of the resolution to the Secretary at least sixty-five (65) days before the Association Meeting at which the Executive Council or the group of at least ten (10) Active Members intends for the resolution to be considered. (c) When the Secretary receives a resolution that has originated from a group of at least ten (10) Active Members, the Secretary shall forward the full text of that resolution to the Executive Council for its consideration. (d) When the Executive Council has received a resolution from the Secretary in accordance with subsection 3.07(c), it shall consider the resolution and specify the details of its support or lack of support for the resolution, including reasons. (ii) the details, including reasons, of the Executive Council’s support or lack of support for each resolution. (i) Those proposing to expedite the resolution as provided in subsection 3.07(f) shall forward it in writing to the members of the Executive Committee in attendance at the Association Meeting at which it is proposed the resolution be considered. (ii) If at least a Simple Majority of the members of the Executive Committee, present and voting at a special meeting of the Executive Committee, determines that the resolution should be expedited and presented to the Delegates for their consideration, the resolution shall be presented at that Association Meeting. (iii) The decision of at least a Simple Majority of the Executive Committee, as contemplated in paragraph 3.07(f)(ii), is final and there is no appeal from it. (g) A resolution affecting the Constitution or the Bylaws shall be handled in the manner provided in article 20. (h) A resolution regarding a proposed budget, when required to be brought before an Association Meeting, shall be handled in the manner described in subsection 16.04(b). (a) Only Delegates are entitled to vote at Association Meetings. (b) Each Delegate is entitled to one (1) vote on each question that comes before the Association Meeting for which that Delegate has been elected. (c) No Delegate is entitled to vote by proxy. (d) Voting at an Association Meeting shall be by show of hands, except where a motion to have a ballot vote is passed by at least a Simple Majority vote of the Delegates. (e) The Chair is entitled to seek the assistance of the scrutineers to ascertain whether or not a motion by a show of hands has been carried or lost. (f) Subject to subsection 3.08(g), a ruling of the Chair that a resolution has been carried or lost is conclusive evidence of that fact without proof of the number or proportion of votes recorded in favour of or against the motion, and the result of the vote so taken and declared shall be the decision of the Members, through their Delegates, upon the question. (g) The Delegates at an Association Meeting are entitled to appeal any ruling of the Chair and, in doing so, must follow the provisions of Robert’s Rules of Order. (h) Except for those to which article 20 applies, all resolutions require the support of at least a Simple Majority of the Delegates present and voting at an Association Meeting. The Chair, with the consent of at least a Simple Majority of the Delegates, is entitled to adjourn an Association Meeting to a fixed time and place. (b) situations where the Executive Council determines that it is appropriate to have the Active Members make a decision by means of a mail-in ballot procedure. At least fifteen (15) days before the date scheduled for the completion of an election or a vote by mail-in ballot, the mail-in ballot forms shall be distributed, either by regular mail or by courier, to the Active Members who are electing a Delegate or who will be affected by the issue upon which the vote is being held. Active Members are entitled to submit their mail-in ballot forms, either by regular mail or by courier, to the Secretary on or before the date scheduled for the completion of the election or vote. (a) The Secretary or her designate shall be responsible to tally the results of an election or vote by mail-in ballot. (b) The Secretary or her designate is the final arbiter in determining the validity of each mail-in ballot form received. (c) Unless otherwise provided in the Bylaws, where a vote is conducted by mail-in ballot, the matter will be considered to be passed upon approval by at least a Simple Majority of mail-in ballot forms received and, in the case of an election, the winner will be the individual receiving the most votes by mail-in ballot. (d) Where a mail-in ballot is conducted according to this article 4 and results in a tie, another mail-in ballot will be conducted to resolve the tie. (e) The fact that an Active Member does not receive a mail-in ballot form shall not invalidate the election or the vote by mail-in ballot. (f) Mail-in ballot forms received shall be destroyed according to the Executive Council’s policy relating to the destruction of mail-in ballot forms. (ii) the number of representatives from each Professional, Occupational, or Composite Group, as those numbers are determined from time to time in accordance with section 5.03. (b) No temporary vacancy on the Executive Council caused by the term of an Executive Council member ceasing, in accordance with subsection 5.06(b), shall affect the number of individuals required to make up the fully-constituted Executive Council. (c) For all purposes in these Bylaws, a reference to the Executive Council means the fully-constituted Executive Council. (d) is not an Active Member. (iii) determine the number of representatives that each Professional, Occupational, or Composite Group is entitled to elect to the Executive Council. (b) The Executive Council is entitled to make the determinations and designations described in subsection 5.03(a) at any time, and, in doing so, shall consult with the affected Members or groups of Members, but the decision of the Executive Council shall be final. (E) the signature of the Active Member being nominated, signifying that individual’s consent to the nomination. (ii) Distribute the nomination papers to the Active Members at least thirty (30) days before the end of the Fiscal Year, for the positions that are subject to election to office in the next Fiscal Year. (b) Nomination papers shall be returned to the head office of the Association by the close of business on the last day of the Fiscal Year. (i) Mail-in ballot forms will be distributed immediately to Active Members eligible to vote for the contested seat and will be accompanied by appropriate instructions, including details as to when and where they must be returned in order to be considered valid ballots. (ii) Completed mail-in ballot forms must be returned, either by regular mail or by courier, to the head office of the Association at least fifteen (15) days before the next Annual Meeting. (iii) Each nominee is entitled to appoint a scrutineer to be present when the mail-in ballot forms are counted. (iv) The Executive Director or her designate is responsible to tally the results of the election by mail-in ballot. (v) The Executive Director or her designate is the final arbiter in determining the validity of each mail-in ballot form received. (vi) The winner in an election to a position on the Executive Council will be the individual who receives the most votes by mail-in ballot. (vii) The fact that an Active Member does not receive a mail-in ballot form shall not invalidate an election by mail-in ballot. (viii) Mail-in ballot forms received shall be destroyed according to the Executive Council’s policy relating to the destruction of mail-in ballot forms. (d) If only one (1) nomination is received for any vacant position on the Executive Council, the Executive Council may dispense with the mail-in ballot process and declare, by a Simple Majority of those present and voting at an Executive Council meeting, that the nominee for that vacant position is elected by acclamation. (e) Where a mail-in ballot is conducted according to this section 5.04 and results in a tie in the election of the President or in filling the last of the regular positions on the Executive Council, another mail-in ballot will be conducted to resolve the tie. (f) If an individual elected as President occupies an existing seat on the Executive Council by way of representing a Professional, Occupational, or Composite Group, she must resign that existing seat to serve as President and the vacancy shall be filled in accordance with Section 5.07. (a) Except as otherwise provided in subsection 7.02(g), an Active Member who meets the qualifications set out in section 5.02 and who has completed at least one (1) full term on the Executive Council at any time is eligible to be nominated and elected President. (b) Nominees for the position of President may be, but do not need to be, members of the Executive Council when nominated to the position of President. (a) The provisions of this section apply to all members of the Executive Council except the President. (vii) her failure to attend four (4) consecutive Executive Council meeting, whether or not she appointed an alternate to attend in her place. (c) To ensure a rotation of terms, the Executive Council may organize an election of members of the Executive Council to provide that approximately half of the members of the Executive Council are elected in any one election. (d) A retiring member of the Executive Council shall be eligible for re-election to the Executive Council. (v) appoint, as an interim member of the Executive Council, an individual who is qualified to represent the Professional, Occupational, or Composite Group, as the case may be, whose seat has been vacated. (v) nomination papers shall be returned to the Secretary within thirty (30) days after the date the nomination papers were distributed. (ii) where no Active member has expressed an interest in assuming the vacant position, leave the position vacant until the next regular annual Executive Council election process. (d) A member of the Executive Council appointed under paragraph 5.07(a)(v) or elected under paragraph 5.07(b)(i) holds office for the remainder of the term of her predecessor. (e) A member of the Executive Council elected to fill a vacancy of a long-standing nature, under paragraph 5.07(b)(ii), holds office for a term defined by the Executive Council before the election. (a) Subject to the Bylaws, the Executive Council shall manage and supervise the affairs and business of the Association. (b) The Executive Council shall be responsible for keeping an accurate and true record of the Association’s membership. (iii) promote the objects of the Association. (viii) present to the Association the ideas and suggestions of the Professional, Occupational, or Composite Group that she represents and speak for the Association to these groups when so requested by the Association. (b) in the case of a criminal or administrative action or proceeding that is enforced by a monetary penalty, the individual had reasonable grounds for believing that her conduct was lawful. (a) The Executive Council shall meet at least four (4) times during each Fiscal Year at the times and places that the Executive Council determines are appropriate. (b) In addition to the four (4) meetings held in accordance with subsection 6.01(a), the Executive Council may meet at other times on the call of the President or any other member of the Executive Council. (a) Except as otherwise provided in subsection 6.02(b), the President or her designate shall give to each member of the Executive Council and to the Board of Governors at least seven (7) days’ notice of each regular meeting of the Executive Council in the manner described in article 14. (ii) in the manner described in article 14 to those members of the Executive Council and the Board of Governors who are not present at that meeting. (ii) in the manner described in article 14. (d) Members of the Executive Council may waive notice of any meeting of the Executive Council or any irregularity in any meeting of the Executive Council, and may do so before, during, or after the meeting to which the waiver relates. (e) Members of the Board of Governors are not entitled or required to waive notice of any meeting of the Executive Council or any irregularity in any meeting of the Executive Council. (a) A member of the Executive Council representing a Professional, Occupational, or Composite Group and who is unable to attend any meeting of the Executive Council shall delegate an Active Member of the same Professional, Occupational, or Composite Group as her alternate to attend the meeting of the Executive Council and to exercise the powers that the Executive Council member would have exercised at that meeting had she been in attendance. 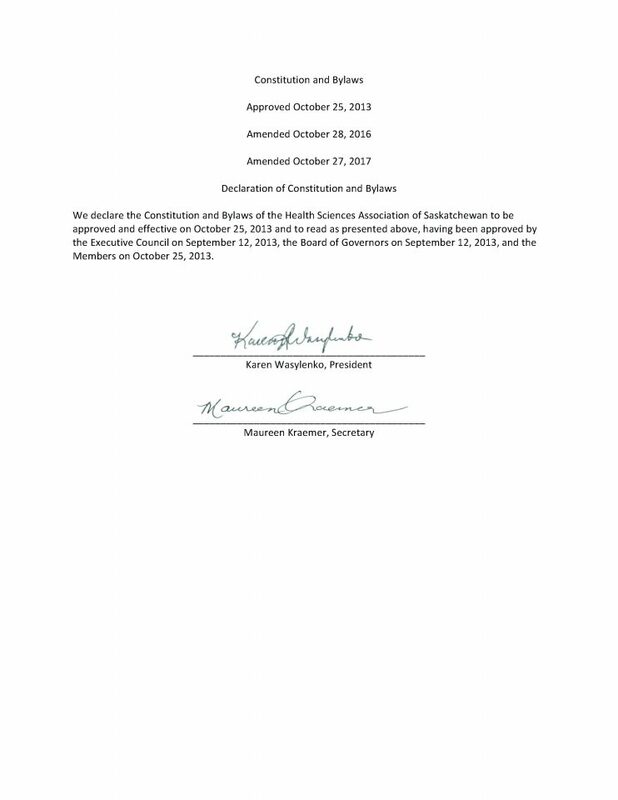 (b) A member of the Executive Council who designates an alternate under subsection 6.03(a) shall provide the President, on or before the beginning of the Executive Council meeting that she will be unable to attend, a written authorization of the alternate to act in her place at the Executive Council meeting. (a) A quorum for any meeting of the Executive Council is a Simple Majority of the number of members of the fully-constituted Executive Council, as described in section 5.01. (b) Except as provided in subsections 6.04(c) and 6.04(d), if a quorum is not present in the meeting room at the time and place fixed for a meeting of the Executive Council, as stated in the meeting notice, or at any time during a meeting of the Executive Council, that meeting shall stand adjourned and no formal business may be transacted. (iii) take measures to obtain a quorum and, after a quorum has been re-established, carry on with the Executive Council meeting. (d) If a member of the Executive Council absents herself from the meeting room because of a conflict of interest, her absence shall not affect quorum. (a) Subject to subsection 6.05(b), the President, or in her absence the Vice-President, shall chair every meeting of the Executive Council. (b) If, at any meeting of the Executive Council, the Chair of the meeting is not present within thirty (30) minutes after the time appointed for holding the meeting, the members of the Executive Council present may choose one of their number to chair the meeting. (a) Unless otherwise provided in the Bylaws, decisions of the Executive Council will be determined by at least a Simple Majority of the members of the Executive Council present and voting. (b) For the purposes of voting on any motion, the President shall have the right to vote with the other members of the Executive Council and shall not have a second vote to break a tie. With the consent of the Chair of the meeting of the Executive Council, a member of the Executive Council or any person entitled to attend a meeting of the Executive Council may participate in the meeting by means of telephone or other communication facilities that permit all individuals participating in the meeting to hear each other, and an individual participating in such a meeting by those means shall be considered present at the meeting. (a) A resolution in writing, signed by all the members of the Executive Council or a committee of the Executive Council entitled to vote on that resolution at a meeting of the Executive Council or a committee of the Executive Council, is as valid as if it had been passed at a meeting of the Executive Council or a committee of the Executive Council, including the Executive Committee. (ii) shall be filed with the minutes of the meetings of the Executive Council or committee of the Executive Council, as the case may be. (x) performs other functions that the Executive Committee, by at least a Simple Majority vote, assigns to her. (b) If members of the Executive Council wish to remove the President from the office of President, the Executive Council must pass a motion of non-confidence in the President by a vote of at least two-thirds (2/3) of the members of the Executive Council present and voting at a regular meeting of the Executive Council. (c) After first passing the vote of non-confidence described in subsection 7.02(b), the Executive Council may remove the President from office by a vote of at least three-quarters (3/4) of the members of the Executive Council present and voting at a special meeting of the Executive Council, called by the Vice-President or any two (2) other members of the Executive Council. (d) After the President has been removed from office in accordance with subsections 7.02(b) and 7.02(c), the Vice-President is elevated to the office of President and the Executive Council shall fill the position of Vice-President. (v) her ceasing to meet any of the qualifications set out in section 5.02. (f) When the Vice-President is elevated to the office of President in the manner described in subsection 7.02(d), that individual holds office as President from the time of being elevated until the end of the next Annual Meeting. (g) A Member who, at any time, has been removed from the office of President in accordance with subsection 7.02(b) or 7.02(c) is not entitled to be nominated or elected as President again. (a) Any member of the Executive Council, except the President, is eligible to be nominated and elected as Vice-President, Secretary, or Treasurer. (b) Each of the Vice-President, Secretary, and Treasurer shall be elected by at least a Simple Majority of the members of the Executive Council present and voting at the first Executive Council meeting following the Annual Meeting. (c) When there are more than two nominees for any of the positions of Vice-President, Secretary, or Treasurer and a majority vote is not achieved in an election, the nominee with the least number of votes will be removed from the ballot and voting will continue until a nominee is elected by at least a Simple Majority of the members of the Executive Council present and voting. (vi) her removal from office according to the provisions of subsection 7.03(e). (e) Any individual holding the office of Vice-President, Secretary, or Treasurer may be removed from her office by a vote of at least two-thirds (2/3) of the Executive Council present and voting at a regular meeting of the Executive Council. (f) The Executive Council, by at least a Simple Majority vote, shall elect another member of the Executive Council to fill the vacancy in any office of the Vice-President, Secretary, or Treasurer. (g) The individual appointed to fill a vacancy in accordance with Subsection 7.03(f) shall hold office for the remainder of her predecessor’s term of office. (c) shall perform other functions that the Executive Committee assigns to her. (e) shall make recommendations to the Executive Council regarding the Association’s banking policies and procedures. (h) shall be a signing officer for financial transactions and shall appoint the other signing officers for financial transactions. The Executive Council, or a committee of it, shall hire an Executive Director and any other employees it deems to be appropriate. The Executive Director and any other employees that the Executive Council hires shall carry out their respective functions according to the position descriptions that the Executive Council approves from time to time for the positions. If Members in any Union Region want to form a Regional Council, they shall petition the Executive Council to constitute the Members of that Union Region as a Regional Council. (a) The Executive Council may delegate to a Regional Council the authority to act on behalf of Members in the Regional Council on matters of local concern. (b) Regional Councils shall carry out their functions according to terms of reference that the Executive Council approves from time to time. (a) Each Regional Council shall elect officers from among the Members in that Regional Council. (b) Regional Council officers shall conduct their affairs in a manner consistent with the objects of the Association as set out in the Constitution. (c) The Regional Council officers shall perform their functions in a manner consistent with the terms of reference that the Executive Council adopts from time to time for Regional Council officers. A Regional Council officer may be removed from office by at least a Simple Majority vote of the members of the Executive Council present and voting at any regular meeting of the Executive Council. (a) A Regional Council may petition the Executive Council to receive direction from the Executive Council on the election, training and duties of stewards. (b) There will be no election of stewards without the approval of the Executive Council. (c) A steward shall represent Members on matters involving their employment. (d) In a Union Region that has one or more stewards, a Member may, but is not required to, use the services of a steward in circumstances where the Member requires representation in a matter involving her employment. The Executive Council shall appoint a Board of Governors according to the policy and procedures that the Executive Council establishes from time to time relating to the Board of Governors. (iv) is not an Active Member. is eligible to be appointed to the Board of Governors. (i) meet jointly with the Executive Council wherever required to do so in accordance with these Bylaws. In order to carry out their duties, members of the Board of Governors may attend and be heard, but are not entitled to vote, at meetings of the Executive Council and the Executive Committee. (a) The Executive Council may establish standing and special committees. (b) The Executive Council shall elect or appoint the Chair of each committee. (i) If the terms of reference for the committee set out any guidelines or rules as to the committee’s composition, the Chair shall follow those guidelines or rules. (ii) The majority of the members of each committee shall be Active Members. (iii) Except as provided in paragraph 11.01(c)(iv), and if possible and reasonable, no more than one Active Member from any one profession or occupation shall sit as a member of a committee. (iv) When a member of the Board of Governors sits on a committee, she is deemed to have been appointed to the committee from the Board of Governors, not from any particular profession or occupation of which she is also a member. (d) Immediately after appointing the committee members, the Chair of each committee shall file the names of the committee members with the Secretary. A standing committee is a committee that exists from year to year. A special committee is a committee formed for a specific purpose and dissolved after the completion of that purpose. (vii) time(s) and method of reporting. (b) Unless the Executive Council provides otherwise in a committee’s terms of reference, every committee is deemed to act solely as an advisor to the Executive Council. (a) In addition to the committee members that the committee Chair appoints, the Executive Council may appoint any member of the Board of Governors to a committee that the Executive Council establishes. (b) Except as provided in subsection 11.05(c), a member of the Board of Governors who has been appointed to a committee has the right to vote on all matters that come before that committee. (c) Members of the Board of Governors who sit on the Finance Committee or on the Governance Committee have the right to be heard but not to vote at meetings of those committees. A member of a committee may be removed from a committee by a vote of at least a Simple Majority of those present and voting at a duly-constituted meeting of that committee. For the purposes of this article 12, “provincial Collective Agreement” means the Collective Agreement between the Association and SAHO Inc. or its successors or assigns. (a) The Executive Council shall elect or appoint a Chair of the Negotiating Committee. (b) The Chair of the Negotiating Committee shall select members of the Negotiating Committee in accordance with the procedures set out in subsection 11.01(c). (iv) make recommendations to only the Executive Council with respect to the terms and conditions of a proposed provincial Collective Agreement. In addition to the provincial Collective Agreement, the Association may negotiate, in the manner that the Executive Council directs from time to time, other Collective Agreements between Employers or organizations of Employers and Members of the Association who are members of other Bargaining Units. (a) The Executive Council shall have the sole responsibility to recommend that the Active Members accept or reject the terms of any proposed Collective Agreement and, for that purpose, shall cause the terms of any proposed Collective Agreement to be communicated to the Active Members in the applicable Bargaining Unit to facilitate ratification of any proposed Collective Agreement for that Bargaining Unit. (b) The Executive Council shall conduct a vote on a proposed Collective Agreement and the provisions of article 4 and this section 12.04 shall apply to all matters relating to the conduct of that vote. (c) Each Active Member in the applicable Bargaining Unit shall have one vote by mail-in ballot in respect of a proposed Collective Agreement. (d) A proposed Collective Agreement is deemed to be ratified when approved by at least a Simple Majority of the mail-in ballots returned from the Active Members in the applicable Bargaining Unit. (vi) committed conduct unbecoming of a Member of the Association. (ii) the President, acting on behalf of the Association, if the President has reasonable grounds to believe that the Member has committed one or more of the acts listed in subsection 13.01(a). (c) No member of the Executive Council or the Board of Governors may be charged under this article for actions taken or not taken by the Executive Council or the Board of Governors as a whole if the members of the Executive Council or the Board of Governors, as the case may be, were acting honestly and in good faith with a view to the best interests of the Association at the time the actions to which the charge(s) relate were taken or not taken. (e) whether the Member laying the charge has personal knowledge of the facts and, if not, where the information is derived from. (a) A charge shall be delivered to the Secretary within thirty (30) days after the date on which the Member laying the charge knew or ought to have known of the action or circumstances giving rise to the charge. (b) No charge may be laid after the time period described in subsection 13.03(a) has expired. (a) The Secretary, as soon as practicable after receiving the information described in section 13.02, shall deliver a copy of the charge to the charged Member by mail, ensuring proof of delivery. (iii) written notice that the charged Member’s response may be limited to admitting or denying the charge. (a) Immediately after the Secretary receives the information described in section 13.02, she shall advise the Executive Council and ask the Executive Council to appoint an investigator. (b) Immediately after the Secretary has advised the Executive Council as required in subsection 13.05(a), the Executive Council shall appoint an investigator who may, but need not, be a Member. (c) The investigator that the Executive Council appoints shall conduct a preliminary investigation of each charge and, for this purpose, is entitled to consider whatever evidence and facts she deems to be relevant. (d) After completing the investigation, the investigator shall advise the Executive Council whether or not the charge has sufficient merit to warrant proceeding to a trial, in whole or in part, and make a recommendation. (e) After receiving the investigator’s advice and recommendation, the Executive Council shall determine, by at least a Simple Majority of those present and voting at a regular meeting, whether the charge has sufficient merit to warrant proceeding to a trial, in whole or in part. (ii) appoint a hearing panel to conduct a disciplinary proceeding. (b) The hearing panel shall be comprised of at least three (3) but not more than five (5) individuals, who may, but need not, be Members, but, in any event, may not include the President. (i) A charged Member has the right to know the charge against her and to have all of the necessary particulars of the charge. (ii) A charged Member must be given reasonable notice of the charge prior to any hearings and must be given reasonable notice of the hearing date. (iii) The hearing must be conducted in substantial compliance with the intent and purpose of the Constitution and the Bylaws. (iv) A charged Member and a Member laying a charge have the right to call evidence, introduce documents, cross-examine witnesses, and make submissions. (v) The trial must be conducted in good faith and without actual bias. (vi) The hearing panel is not bound by the strict rules of evidence; however, any verdict reached must be based on the actual evidence adduced and not influenced by any matters outside the scope of the evidence. (vii) A charged Member and a Member laying a charge have the right to counsel. (b) If the hearing panel finds the charged Member guilty of the charge laid, the hearing panel shall decide the appropriate level of discipline, considering all of the circumstances. (c) If the hearing panel considers it to be appropriate, the hearing panel may give notice to the charged Member and the Member laying the charge that it wishes to receive submissions from them before imposing any discipline. (v) any other measure that the hearing panel deems appropriate or necessary. (a) The Executive Council, in its sole and unfettered discretion, may reimburse the charged Member, the Member laying the charges, or the witnesses, or any of them, for their expenses incurred in respect of any discipline matters described in this article 13. (b) If the Association incurs expenses as a result of processing a charge and the process is not completed due to the Member laying the charges not participating in the hearing, the Association may bill that Member for those expenses and that Member shall immediately remit those expenses as a debt due and owing to the Association. (a) A Member found guilty of a charge under this article 13 has the right to appeal the decision of the hearing panel to the Board of Governors. (b) A Member wishing to appeal a decision of the hearing panel to the Board of Governors must submit a written notice of appeal to the Board of Governors within thirty (30) days after being given notice of the decision of the hearing panel. (c) The Board of Governors shall give notice to the charged Member and the Member laying the charge that they are invited to submit to the Secretary their written submissions on questions of law. (d) If they decide to file written submissions, the charged Member and the Member laying the charges shall file their written submissions with the Secretary within thirty (30) days after receiving the notice inviting their submissions. (e) In considering the appeal, the Board of Governors may consider only questions of law. (f) The Board of Governors shall render its decision on the appeal within thirty (30) days after receiving the last of the written submissions received according to the deadline imposed in subsection 13.09(d). (g) The Board of Governors’ decision on an appeal is final and binding on the parties. (h) In the case of a Member being suspended or expelled from membership in the Association, the penalty will not be implemented in a manner that affects the Member’s employment pending the resolution of the appeal. (iv) sent to her by facsimile or other means of electronic communication at her latest facsimile or electronic communication address shown on the records of the Association. (b) A notice given as described in paragraph 14.01(a)(i) or 14.01(a)(ii) will be deemed to have been given when it is delivered personally or to the address shown on the records of the Association. (c) A notice mailed as described in paragraph 14.01(a)(iii) will be deemed to have been given on the fourth (4th) day after the date of mailing. (d) A notice given as described in paragraph14 .01(a)(iv) will be deemed to have been given on the date the sender receives back the facsimile or other electronic communication answer confirming receipt by the recipient. (e) The Secretary may change or cause to be changed the recorded address, facsimile number or any other electronic address or number of any Member in accordance with any information which he or she reasonably believes to be reliable. Unless otherwise determined by the Executive Council, the Fiscal Year of the Association shall terminate on August 31st of each calendar year. The Executive Council shall cause to be kept the proper records and accounts of all transactions of the Association. (a) Before the end of each Fiscal Year, the Finance Committee shall provide to the Executive Council a proposed Association budget for the next Fiscal Year. (ii) reject it and request the Finance Committee to prepare a new proposed budget. (c) After the Executive Council approves a proposed budget, or a proposed budget with amendments, it will forward it to the Board of Governors for its consideration. (a) The Finance Committee shall submit to the Executive Council all proposed special appropriations exceeding the provisions of the approved budget for a Fiscal Year. (iii) reject them, or any of them, and request the Finance Committee to prepare a new request for the special appropriations that were rejected. (c) After the Executive Council approves one or more special appropriations, or approves special appropriations with amendments, it will forward them to the Board of Governors for its consideration. (iii) reject them, or any of them. (a) If the Board of Governors rejects the proposed budget or the special appropriations or any of them, then the Board of Governors and the Executive Council shall hold a joint meeting to resolve the issues. (b) If the Board of Governors and the Executive Council, meeting jointly, cannot resolve the issues relating to the proposed budget or the special appropriations, the President shall call a Special Meeting or include the matter on the agenda for the next Annual Meeting, whichever would occur first, for a resolution by at least a Simple Majority of the Delegates present and voting at that meeting. (a) The Executive Council, by at least a Simple Majority, shall, approve the quarterly unaudited and annual audited financial statement of the Association. (iii) any further information respecting the financial affairs of the Association. (c) The Delegates at the Annual Meeting, by at least a Simple Majority of those present and voting, shall receive the annual audited financial statements of the Assocation. (d) Following the Annual Meeting, any Member may request and the Association will deliver to that Member a copy of the Association’s most recently approved annual audited financial statements and the report of the auditor. The Delegates shall appoint the auditor by at least a Simple Majority of the Delegates present and voting at the Annual Meeting. (a) The Finance Committee, from time to time, will submit to the Executive Council expense guideline recommendations relating to reimbursement of members’ expenses, including the cost of travel, meals, and accommodations. (b) The Executive Council, from time to time, after considering but not necessarily being bound by the Finance Committee’s expense guideline recommendations, shall approve expense guidelines relating to the reimbursement of Members’ expenses, including the cost of travel, meals, and accommodations. (a) A Member who has incurred expenses while engaged in the business of the Association (as approved by the Executive Council), including loss of wages while on Association business, may submit to the Treasurer a claim for reimbursement of those expenses, and shall include all receipts required according to the current approved expense guidelines. (b) If the Executive Council determines that the expenses a Member submits for reimbursement are legitimate, the Executive Council will approve them according to the current approved expense guidelines. (a) Except as provided in subsection 16.09(b), each member of Executive Council shall serve in that capacity without remuneration. (b) A member of the Executive Council may be reimbursed according to the approved expense guidelines for expenses incurred in the course of carrying out her duties, and may be remunerated for services performed for or on behalf of the Association in the manner and in the amount approved by the Executive Council. (a) The Association shall transact its financial business, or any part of it, with banks, trust companies, credit unions, or other bodies corporate or organizations that the Executive Council designates from time to time. (b) The Treasurer shall specify the signing officers who will be authorized to transact its financial business, or any part of it, including the power to sign cheques. The Association, by resolution approved by at least a Simple Majority of the Delegates present and voting at an Association Meeting or by a resolution of the Executive Council, approved by at least a Simple Majority of the members of the Executive Council present and voting, may borrow money necessary for the conduct of the affairs of the Association and may give security that may be necessary to secure the borrowing. (a) Except as provided in paragragh 2.04 (c) (vi), upon the liquidation and dissolution of the Association, the remaining property of the Association shall be distributed in equal shares to the individuals who are Members on the date of the liquidation and dissolution. (b) Except for the general direction given in subsection 16.12(a), all details of the liquidation and dissolution will be handled in the manner determined by the Executive Council. Contracts, documents, and instruments in writing requiring the execution by the Association shall be signed in the manner provided in the signing policy established from time to time by the Executive Council. No Member of the Association shall be liable, in her personal capacity, for any debt or liability of the Association. Except where otherwise provided in the Bylaws, all matters of procedure at any meeting of the Association or the Executive Council shall be decided in accordance with Robert’s Rules of Order. Subject to compliance with sections 20.02, 20.03, and 20.04, any provision of the Constitution or the Bylaws may be enacted, amended, repealed, or replaced by a vote of at least two-thirds (2/3) of the votes cast by the Delegates present and voting at an Association Meeting. (b) there has been full compliance with the rules set out in section 20.03. (ii) If a resolution has not received the support of at least two-thirds (2/3) of the members of the Executive Council present and voting at a meeting of the Executive Council, the resolution shall die. (iii) The Executive Council shall forward its Executive Council approved resolution to the Board of Governors for its consideration. (iv) If the Board of Governors ratifies the Executive Council approved resolution by at least a two-thirds (2/3) majority of those present and voting at a meeting of the Board of Governors, the Board of Governors shall notify the Executive Council of its approval and the Executive Council will ensure that the resolution goes to the Members with the notice of the Association Meeting. (v) If the Board of Governors does not ratify the Executive Council approved resolution by at least a two-thirds (2/3) majority of those present and voting at a meeting of the Board of Governors, the Board of Governors shall notify the Executive Council of its decision and the Executive Council and the Board of Governors shall meet to attempt to reach agreement on the resolution. (vi) If the Executive Council and the Board of Governors cannot reach agreement on the Executive Council approved resolution, the Secretary shall forward the full text of the resolution to the Members with the notice of the Association Meeting along with the details of the disagreement between the Executive Council and the Board of Governors. (i) The Secretary shall forward the resolution to the Executive Council for its consideration. (ii) If the Executive Council does not approve the resolution by at least a two-thirds (2/3) majority of those present and voting at a meeting of the Executive Council, the resolution shall die. (B) it shall forward the resolution, as amended, if applicable, to the Board of Governors for its consideration. (iv) If the Board of Governors ratifies, by at least a two-thirds (2/3) majority of those present and voting at a meeting of the Board of Governors, the resolution it receives from the Executive Council, the Board of Governors shall notify the Executive Council of its approval and the Executive Council will ensure that the resolution goes to the Members with the notice of the Association Meeting. (v) If the Board of Governors does not ratify, by at least a two-thirds (2/3) majority of those present and voting at a meeting of the Board of Governors, the resolution it receives from the Executive Council, the Board of Governors shall notify the Executive Council of its decision and the Executive Council and the Board of Governors shall meet to attempt to reach agreement on the resolution. (vi) If the Executive Council and the Board of Governors cannot reach agreement on the resolution, the Secretary shall forward the full text of the resolution, as amended by the Executive Council, if applicable, to the Members with the notice of the Association Meeting along with the details of the disagreement between the Executive Council and the Board of Governors. (a) Delegates voting at an Association Meeting on a resolution affecting the Constitution or Bylaws may amend, on the floor of the Association Meeting, the resolution of which they received written notice, but no amendment may propose a change greater in scope than that for which notice was given. (b) If Delegates at an Annual Meeting wish to amend a resolution affecting the Constitution or Bylaws in a manner that effects a change greater in scope than that for which notice was given, they may bring their proposed amendment before the next Association Meeting by complying with the provisions of section 20.02 and following the rules set out in subsection 20.03(b). (r) violating the published policies of the Association.